Normally I like to really put a product through it's paces before I do a review. In this case I just purchased these boots last Monday but in that one week I have put them through a rather complete test. My main touring boots are (were) the Sidi Way Rain boots that are about 8 years old yet still look very good. Sidi boots are very good but recently I have been looking at the BMW boots. I was considering two boots - the Airflow and the Allround - for different reasons. The Airflow boot should be a cooler boot and I live where it's hot about 10 months out of the year. But then again, I liked the Allround boot because ... well they are good all around boots. To my surprise the dealer where I took my bike for a LH switch gear exchange was having a sale on boots including a large number of Allround, a few Air Flow, and one pair of Pro Touring 2 boots. The Air Flow and Allround boots were discounted to $218 while the Pro Touring had a much better discount. The regular dealer sticker price was $379 and the sale price was $226. A quick check with Amazon showed a price of $359 plus $23 shipping so my attention shifted to the Pro Touring 2 boots. I'm explaining the pricing in detail because I really wanted the Allround boots but for only $8 more I had to get the Pro Touring 2 Boots. Even though I've only had the boots for a week I have put about 2,500 miles on them, hiked over miles of rough terrain, ridden in the rain, ridden for 100 miles in 44 degree weather, used in a low of 31 and a high of 96 degrees, and walked across a shallow river with these boots. Let me start off by saying that during all these rides and walks I never felt the boots were an issue. As a matter of fact the only times I thought about the boots was when I felt I was abusing them like while rock climbing and walking in ankle deep water. The day after purchasing the boots I had a leg on our tour of about 150 miles from Fort Stockton to Carlsbad Caverns NP. The temperature was 44 degrees and stayed at that temperature for about 100 miles. The only issue was that I felt a little cold air flow in from the top of the boot down to my ankle. I felt the same thing the day before where it was hot (mid 80's) and considered that a nice feature. 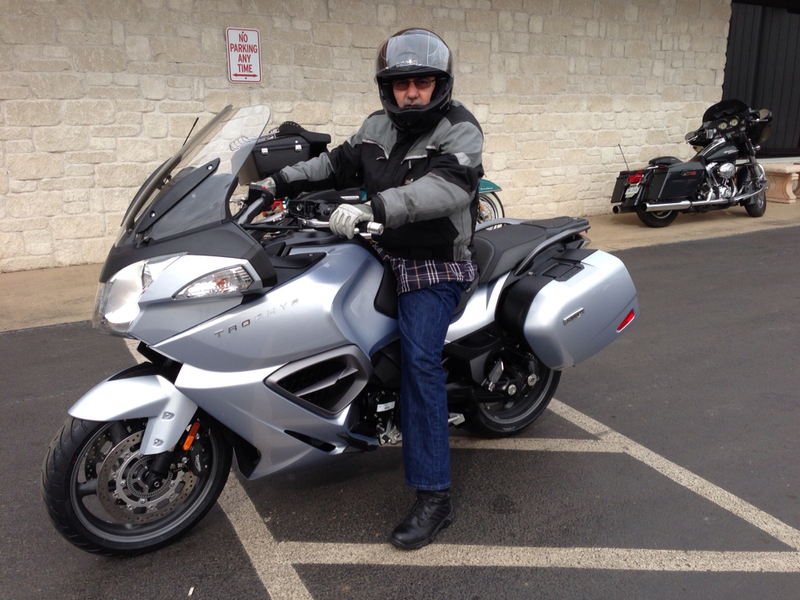 But now it was cold and my riding gear was mostly summer gear since we were touring in Texas and New Mexico in late April. We did not expect these weather conditions. This was only my second day with the boots and knew little about all its features but while riding I raised my pant leg and redid the Velcro upper closure on each boot. Totally different feel. No more cold air drafts! Totally comfortable in cold weather riding. The boots claim to be comfortable for every day walking. I totally agree with this claim after hiking down to the base of Carlsbad Caverns. It's all down hill for about 750 feet. It's a tough test for new shoes or boots but once again I had no problems with the boots. Later that day we rode to Guadalupe Mountain NP and then to Fort Davis. After we rode up to the McDonald Observatory we went to the old Fort Davis Park and toured the old military base on foot. More walking with the boots but this time it was mostly on flat dirt and gravel trails. Easy test for the boots. The major walking test was the following day at Big Bend NP. I hiked the Window trail which is 4.25 miles round trip both up and down terrain and rocks and boulders to walk over. This is where the boots took a beating from the rough terrain but I was surprised by the comfort of the boots and how well they gripped the rocks I had to go over. I was exhausted after the hike but my feet felt fine. Next came the Santa Elena Canyon that is craved by the Rio Grande River. I decided to walk to Mexico since the water was so shallow. My main reason for doing this was to test the waterproof feature of these boots. I felt the coolness of the water but no water got into either boot. My stay in the river was only minutes but it did get a little deeper than the photo above. I used the boots every day for six straight days and really like them. There is little not to like about these boots. They are taller than any of my other boots which I like. I haven't really tested them in very hot weather and by that I mean over 100 degrees F. The outer material is leather which my Sidi boots are not therefore I would think these boots still need some more break in time. The leather seems softer than any of my other boots. They should get even better as the miles add up. categories "BMW boots Boot review", "motorcycle touring"
I went with full face helmets about 35 years ago. 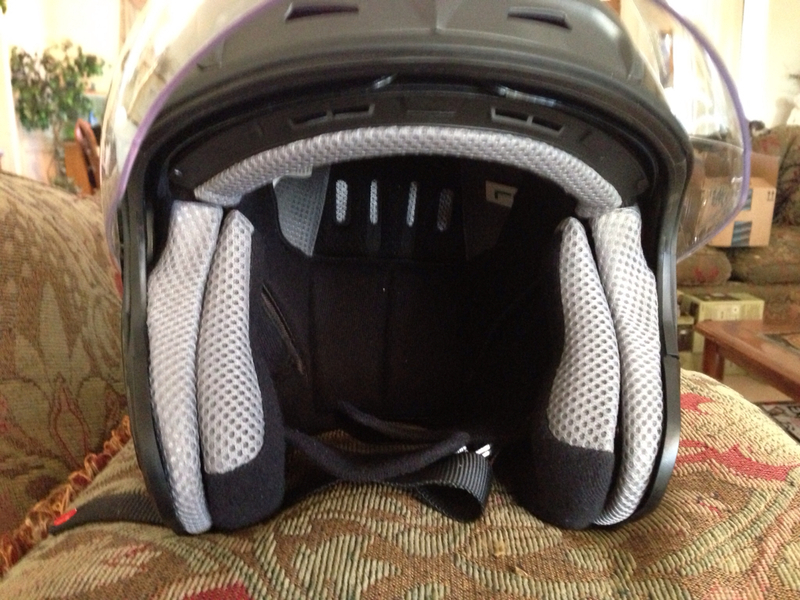 For one thing I figured they were safer than an open face helmet. In addition, my motorcycle insurance company was running a promotion on a generic full face help for about $20. I couldn't go wrong with that price but at first I felt all boxed in. It took me a few months to get used to the full face helmet. So why did I purchase an open face helmet this past week after so many years of using full face helmets? 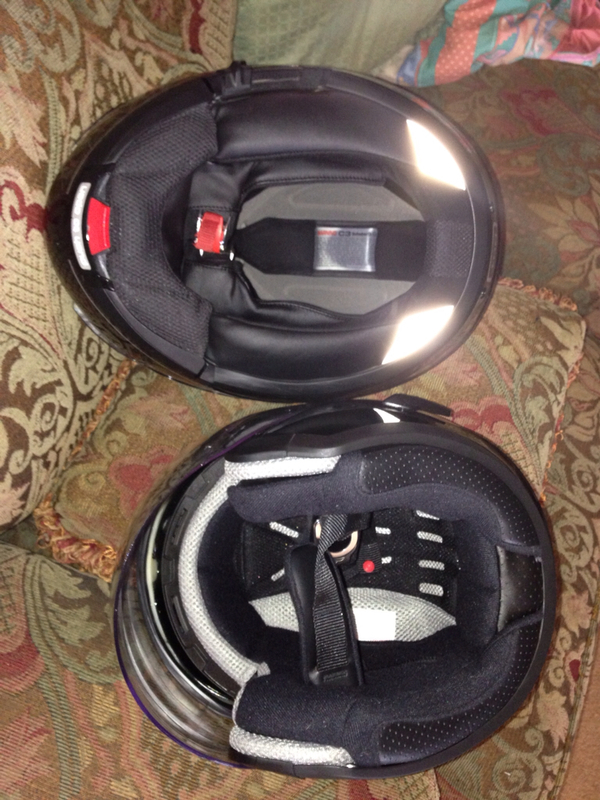 In addition, I recently got a new expensive full face helmet so why buy a cheap second helmet? 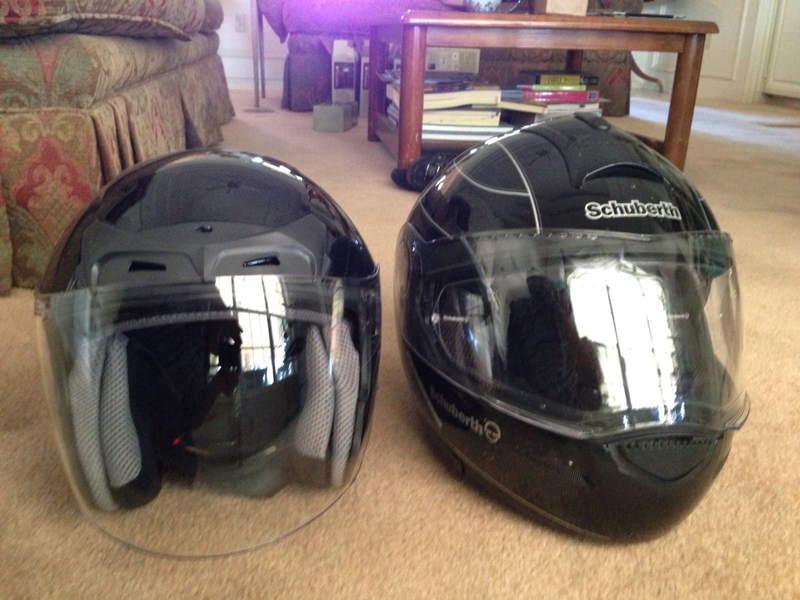 The reason for the new helmet is my new second motorcycle. It's a bit of a sport bike with that forward lean created by low, narrow bars. I found that when I used my Schuberth C3 I had to really cocked my head back more than normal because the helmet rides rather low over my brow. It's never a problem on my touring bike but doesn't work too well on my sport bike. I found that I really enjoyed riding the Super Hawk without a helmet but that's a no-no. 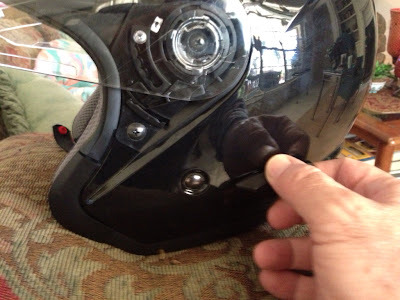 Thus my justification for buying a new helmet. I intended to purchase a helmet with minimal features and extras. The first ones I looked at were half helmets. The price of a half helmet and a regular open face helmet was about the same so I decided that I might as well get a better grade helmet. We all know the saying... "what value do you place on your head..." The two I settle on are shown in the picture above. 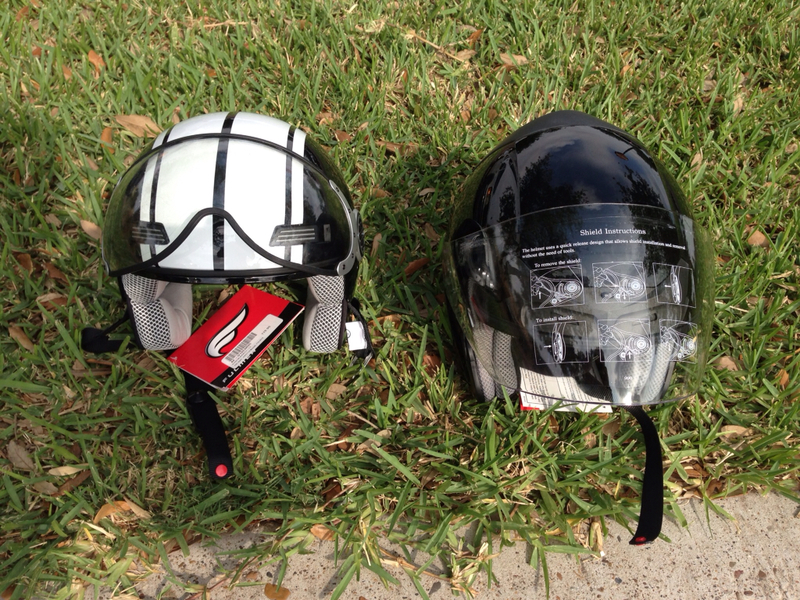 I really liked the pilot type helmet shown on the left in the picture above but when I closed the face shield the bottom edge of the shield was about 1/8 of an inch from the tip of my nose. I figured wind blast would push it again my nose. No returns on helmets at the store I was at so I didn't want to risk it. 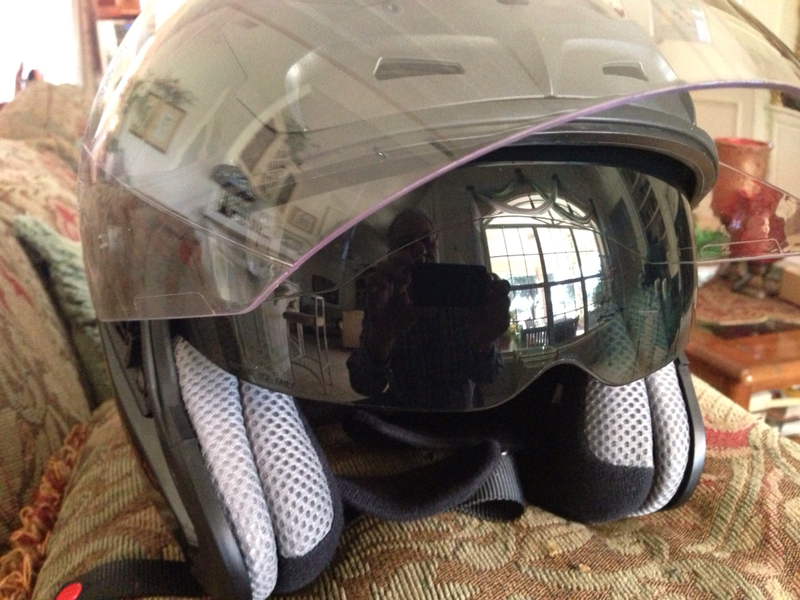 I decided on the Fulmer 75B helmet. In the store it looked very nice and the cost was ok at $109 (plus tax). I put the helmet on and rode home on the Super Hawk. 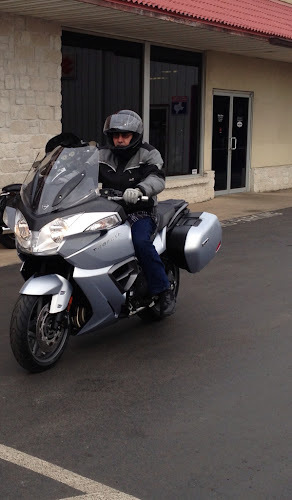 Once I got home I switched bikes and went out for a ride on my R1200RT. The helmet is very nice. 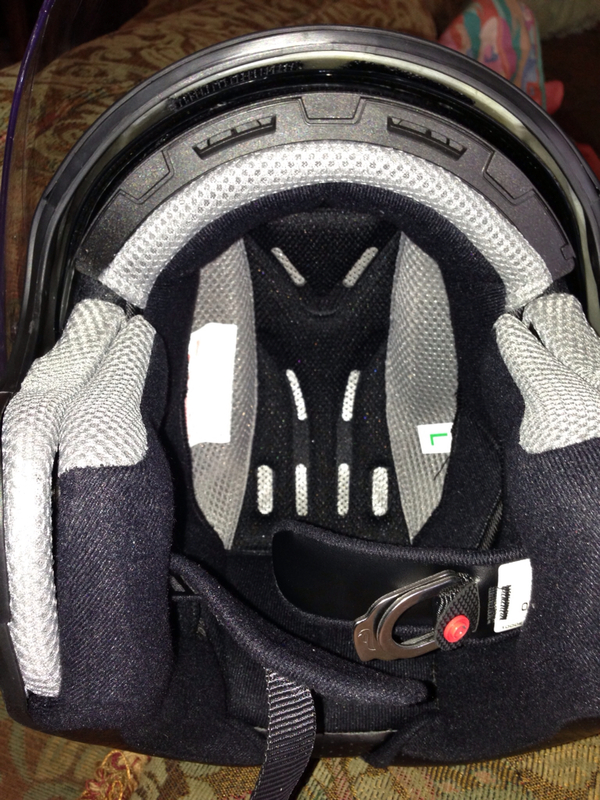 Here are the pros and cons as I see it after a short week of using the Fulmer 75B. 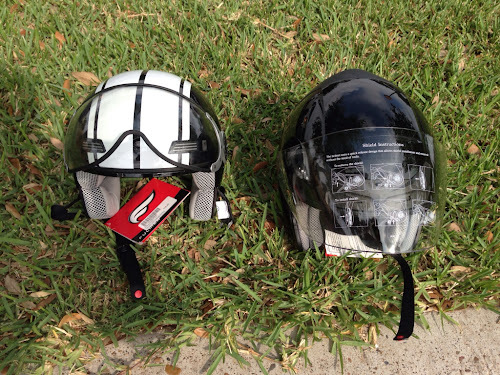 categories "Fulmer helmet review", "Schuberth helmet", "motorcycle touring", "motorcycle"